First things first…the game reminds me a lot of NBA 2k11. I’m not saying that there are no significant differences between the two games but if anyone has any expectations that the game will be completely different than last years game, this isn’t the game for you. The good thing for me is I loved NBA 2k11 so I was very happy with the game I saw. FYI, the version of the game that I played is the retail version so what I saw is what will be released Oct. 4. I watched two quick exhibition games before getting the chance to play (Miami/Dallas and Washington/Lakers). The first thing I noticed was the improved presentation. The stat overlays are improved (showing stats like the number of points Dirk had compared to the rest of his team) and multiple starting lineup screens (Some games show each team’s lineup individually and some show them on the same screen). I wasn’t able to get much of a feel for the game from watching the two games because one of the players was a newcomer when it came to 2k and struggled with the controls. Some small things I noticed was the new Washington Wizards court, redone faces for every player and head coach and that you can interact with the first row of the crowd (I noticed Lebron leap over the scoring table when going for a loose ball). Simply put the AI is much smarter and more realistic. I’ll give you two examples: One, I started the game killing Boston by running pick and rolls with Westbrook and Isos with Durant. By the middle of the first, Boston’s D started adjusting doubling Westbrook on pick and rolls and cheating with a second defender against KD. The defense against KD was great as you could see defenders like Allen sag off Sefolosha and help against KD but not fully commit to doubling KD. The second example comes in the second quarter. I wanted to test the AI by running the same play a few times and seeing if it adjusted. I ran a pick and pop with Maynor and Cook. The first time I ran the play, Cook set the pick and popped to the 3 point line. Both defenders stayed with Maynor and he hit Cook for a wide open 3. Next offensive possession, I ran the same play and Cook’s defender stayed with him. I ran it one more time and this time both defenders stayed with Maynor but a third defender rotated to Cook. That’s the kind of AI I love….same play three times and three different results. I also love the new playcalling. 2k explained how it word on the last Insight but it adds a ton to the game. Next I spent bout an hour playing My Player. I’ll be honest My Player isn’t my favorite mode and I rarely spend much time playing it but there are a good amount of improvements in this year’s version. The mode begins with you playing in a college all star game at Madison Square Garden. My biggest frustration with this mode in the past was I felt it sometimes penalized you for playing realistic basketball. For example, there were times when I would be penalized for taking a good shot just because I missed it. This year is different though. I probably shot 35% from the field but I rarely forced shots and was rewarded for playing good fundamental basketball. The biggest change I saw was the addition of franchise interviews before the draft. Three GMs will meet with you and ask you a series of questions. The questions are team specific (Phoenix asked me how I felt about learning from Steve Nash and the Bucks asked me if I was OK with playing with Brandon Jennings) and depending on how you answer them determines your draft status (I told Phoenix that I would love playing with Nash and told the Bucks they should trade Jennings and draft me.). Next comes the draft and there is a little bit of drama to it. You have to watch the entire draft until your name is called (no skipping) and listen to David Stern (Stern’s real voice) call each name. Other additions include contract negotiations, players get paid a check each month and can use the money to purchase attributes or do activities to make them more popular (like pay for team activities). The final mode I saw was the NBA’s greatest mode. I played the Bill Russell and Patrick Ewing games and they couldn’t be more different. The Russell game was slower paced and felt like a game from the 50’s. Plenty of set shots and animations similar to how players played during that time. Many of you have seen the presentation for this game (Black and white, grainy footage and 50’s style audio) and its very authentic. As much as I liked the Russell game, the Ewing game is what made me fall in love with the game. One, the presentation looks just like TNT’s presentation from the 90’s and the Garden is spot on with the correct court, constant organ sounds and even the chime after every Knicks basket. -	Penny Hardaway is every bit of the unstoppable athlete that he was before injured. -	The Ewing/Starks combo is fun. Starks is a very streaky shooter though. -	Only AI mistake I saw was the Magic ran was it ran 3 plays for Dennis Scott in the post. I don’t remember Scott being a post threat. At the end of the day, I was very excited about this year’s game. It’s a continuation of last years game but it has enough of improvements and additions to make it worth $60. -	No rookies will be in the retail version but will be added by a roster update after the lockout is over. According to 2k, the transition will be seamless and the rookies’ names and references are already in the game. -	The announcing is once again incredible and Steve Kerr is a great addition. After listening to Madden’s horrible commentary, the commentary in 2k is a revelation. - No Association or Online questions because I didn't play either mode. - If I don't respond to a question its because I don't have an answer, DO NOT REPOST OR BUMP YOUR QUESTION. On defense, when running back to defend your court, did you ever lose control of your player because he was "suctioned" into defending another nearby player? In my player was u able to adjust the wingspan..and r we able to sim games this year? Saw a little suction when it came to the lane. Got sucked into a post defend animation a few times. Not a constant issue though. did they have alternate jerseys in my player? GREAT preivew/review ! How would you rate the fun factor of 2k12 vs 2k11 ? Not sure about wingspan. No game sims in my player. Whoa..actual msg logo there? wow! Only question I have is Ewing's drop step in there? if you ever say him play he would post up and he would take 2 huge steps towards the basket and either shoot or try to dunk. Wow MyPlayer sounds amazing. So excuse me if I'm ignorant, but do you use your money to buy attributes now instead? Are skill points completely remove or are they there as well. Were there actual plays ran for you based on your strengths? Sorry no MSG logo. Still just NY arena. Ewing's drop step is in the game. On the break did slashers attack the rim from the wing at proper angles? In that same vein, were passes thrown correct angles to allow for easy, fluid, finishes at the rim? Concerning defensive transition, did players make sound threat assessments, i.e. stopping the ball, protecting the paint first, cheating toward the most dangerous finishers? Skill points are still in the game. Money can be used also. I only played the college all star game so there were no plays called. Excited to hear of improved fastbreak logic...I assume you are implying that now lanes will be filled correctly? No more running to corner by CPU to spot up for 3, rather than continuing to bucket? 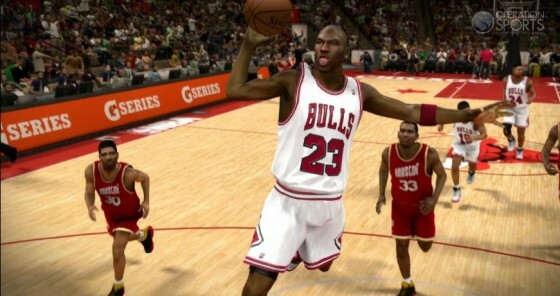 haha oh man 2k out did themselves! Did you like how smooth the shooting is now? From reading the previews it sounds like its going to be fun shooting with the new momentum. - Yes but I feel that the slashers were a step slow. - That was a little hit or miss. I felt there were a few breaks where the wrong pass was thrown. Could have been a control issue on my part. - Yes. on the 3-1, the D would force me to make a decision by guarding the player with the ball. I forced a few shots by not passing at the right moment. Yes, walk up anims are in the game. No more hunch back anime. Is the Combine and such still there? Or did the College Game replace it? Secondly, how did the pull up J's feel? Did it feel sluggish/clunky? Felt better still not as quick as I want them but not as sluggish as last year. Shooting was fun. I loved playing with Durant and using his various anims from his shooting motion, layup anims and post game. Did you create your player if so, have they improved the create a player options in terms of hair,tattoos,gear? You said no Combine so the College All-Star game is the only time you get to display on court skills? Are playing in the College All-Star game and your GM interviews what decided you being drafted, or are there like drills and scrimmages to test your mettle?